The regular season is over. The Major League playoffs are down to the Final Four. Regarding my quest to visit and photograph ballparks, these semi-finalists include two teams I have yet to visit – the Los Angeles Dodgers and Houston Astros and one iconic stadium that has already been posted – The Boston Red Sox’s Fenway Park. The last of the teams remaining is one of the more improbable ones. The Milwaukee Brewers, in the smallest market in the game, with one of the smaller payrolls, has made it to the National League Championship Series. Good for them. On July 24, 2001, we began a Wisconsin family visit by starting in Chicago so we could catch a game at Wrigley Field. That event was posted here on 10/31/16. 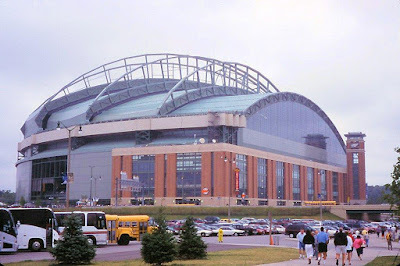 The following day, we were in Milwaukee and took in a game at the brand-new Miller Park. 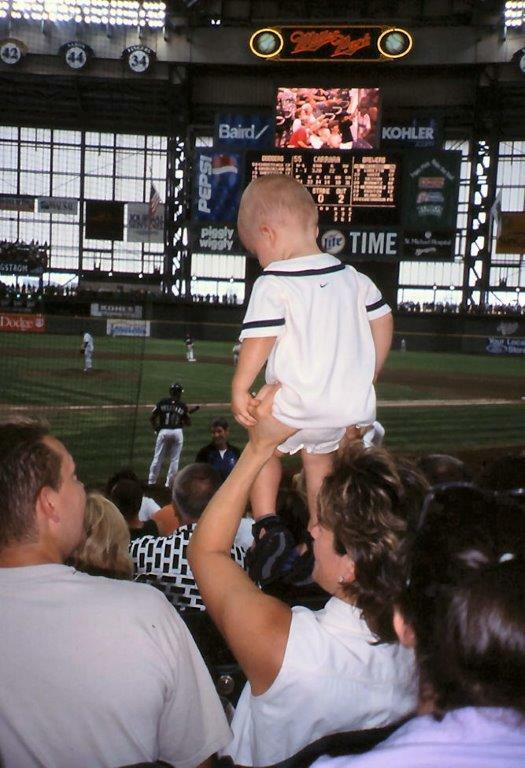 This was the first year the park was open for business. The earliest domed stadia, like the Astrodome in Houston and Superdome in New Orleans, had to install artificial turf because grass doesn’t grow well indoors. 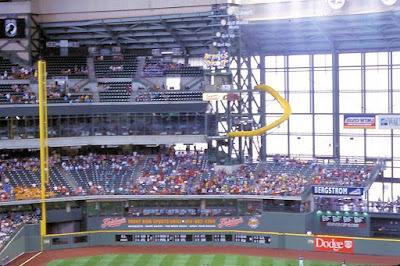 Later designs incorporated retractable roofs to allow in sunlight (and rain) when appropriate and allow games to be played in inclement weather. 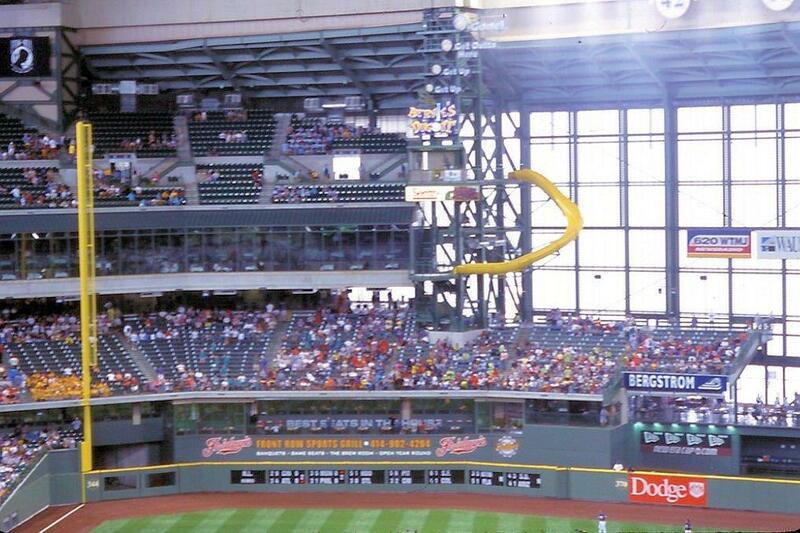 Miller Park has the game’s only fan-shaped retractable roof and it can be opened or closed in just ten minutes. I am one who is all for the occasional indoor game in Wisconsin…I still remember attending a Brewer game in 26° cold one evening. 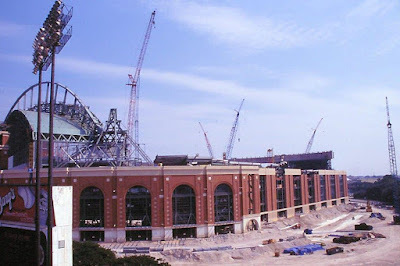 The park’s opening was delayed a year after a serious construction accident. Less than two months before this picture was taken, the high cranes used to lift huge sections of the retractable roof were carrying a 450-ton load and collapsed in winds too strong for the task. Three iron workers were killed and the damage was sufficient to delay the schedule a year. The team had to use old County Stadium for another season. We reported on that venue on 8/3/17. 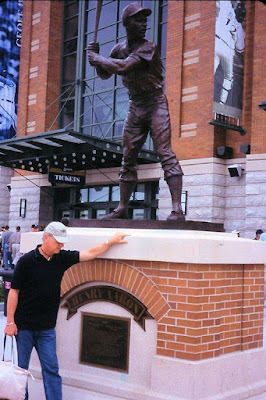 It seems that all the new ballparks have promenades that include statues of former greats. Even if your team is having a lousy year, you can take in a game and celebrate past heroes and glories. 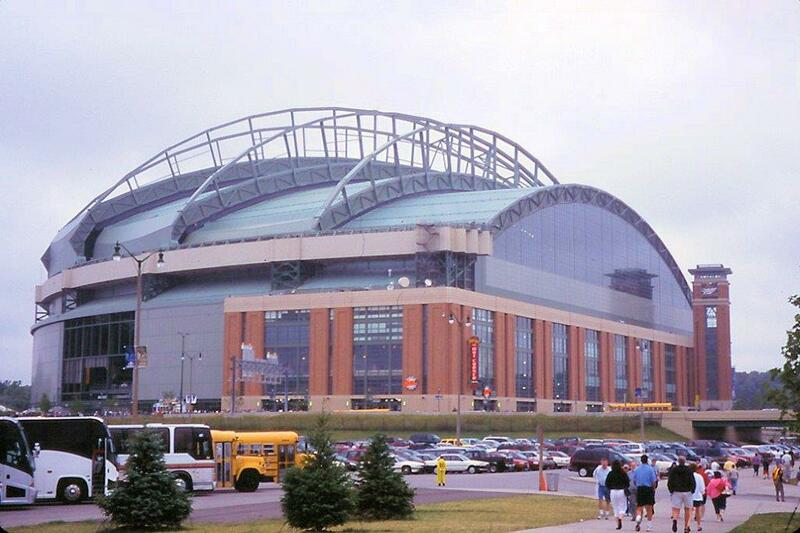 On that day, the Brewers played the L. A. Dodgers…the same team they are battling now for a spot in the World Series. The visitors came to town with a winning record…13 games over .500 and the Brew Crew, on their way to a 4th-place finish in their division, were 13 games under .500. The fans that stayed to the end (we had to drive north to the family) were pleased as the Brewers took the early lead, lost it but won the game in the 9th inning, 4-3. The box score and all related stats are available through the link in the date at the beginning of this post. Check out the lineups in that game. The Dodger players included Gary Sheffield, a member of the ‘500 Home Run Club’ and Alex Cora, who this year as manager of the Boston Red Sox, led his team to the best record in the game. Adrian Beltre, now with the Texas Rangers, was the Dodger third baseman then and is still playing. He recently hit that rare milestone of 3000 career hits and should certainly make it to the Hall of Fame. Team mascot Bernie Brewer’s chalet and slide from County Stadium were saved. Back then, after a Brewer hit a home run, Bernie, in full lederhosen get-up, skimmed down a slide straight from the chalet into the foamy head on top of a full beer stein. Now, his chalet is ‘Bernie’s Dugout’ and he hurls himself from the end of the (often empty) upper deck onto a curving slide that ends on the floor of the deck below. As I write this, the Brew Crew is down three games to two in the best-of-seven series. I remember watching the team lose in its only World Series appearance in 1982. While their championship futility hasn’t approached that of the Cubs or Red Sox, I do hope to live long enough to see them spray the cheap champagne and raise a banner for their Wisconsin fans.